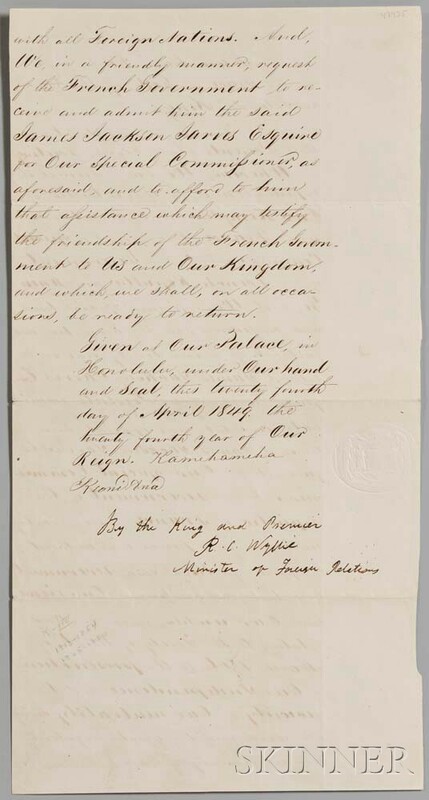 Kamehameha III, King of Hawaii (1813-1854) Document Signed, Honolulu, 24 April 1849. Kamehameha III, King of Hawaii (1813-1854) Document Signed, Honolulu, 24 April 1849. Single leaf inscribed on both sides, appointing James Jackson Jarves (1818-1888) Hawaii's Special Commissioner to France. Old folds, with the blind-stamped seal of the Kingdom of Hawaii, housed in a custom box, 13 3/4 x 7 1/4 in.